Native from Pennsylvania to the Southeast, or perhaps only in North Carolina. Spreading from cultivation to roadsides, bluffs, old farm sites, and such places. 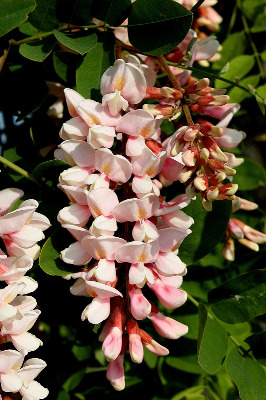 First collected in 1884 in Kent Co.
A specimen of Robinia neomexicana A. Gray, a frequently cultivated small tree from the western US, was collected in Houghton Co. in 1976, with the note that it "reproduces well by suckers in Houghton." It is probably not fully established outside of cultivation. It has rose pink flowers, deeper that those of R. viscosa, and lacks both warty glands and stiff, spreading hairs on the branchlets. MICHIGAN FLORA ONLINE. A. A. Reznicek, E. G. Voss, & B. S. Walters. February 2011. University of Michigan. Web. 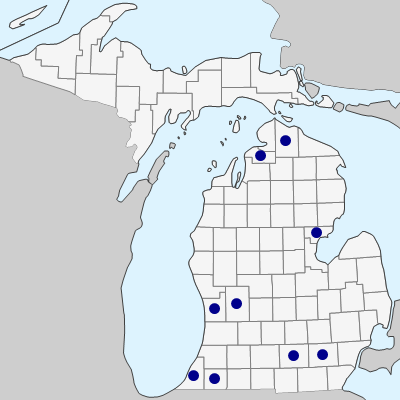 April 18, 2019. https://michiganflora.net/species.aspx?id=1344.